So, how was your experience in the Apprentice 55th Batch Exam held on 26th March 2017? Certainly, it would have been very good based on your amazing preparation and performance towards the exam. The OFB, which stands for Ordinance Factory Board, has been conducting different Batches Exams for the post of Apprentice over many years. It recently organised one for the 55 Batch and will release OFB Trade Apprentice Result 2017 for Non-ITI and ITI posts. The main objective to conduct this 55th Batch Trade Apprentice (TA) was to recruit suitable people for a huge number of ITI and Non-ITI posts. The management for the test was done in two sessions i.e. Forenoon and Afternoon. This is about Phase-I and the date for Phase-II will be told to the respective candidates. 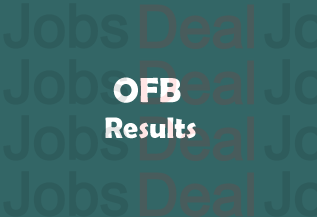 OFB Trade Apprentice Merit List/ Cut Off Marks 2017 for 55th Batch Apprentice. There are several factors what need to be considered while checking the 55th Batch Merit List of this exam. Current Update (31/03/2017): A written exam for Trade Apprenticeship Training (Phase-I) for ITI and Non-ITI candidates in Ordnance & Ordnance Equipment Factories for 55th Batch of TA was conducted on 26.03.2017. In this exam, approximately 4.45 lakh aspirants have taken part and are now eager to know about the result declaration. We tell all such aspirants to wait and to know the names of the shortlisted candidates for the Phase-II. Since the selection process is not only based on Phase-I, therefore, the applied aspirants have to go through the Phase-II too. Now, only written exam has been carried out and the Interview is yet to be conducted in the upcoming days. For around 6948 vacancies of Trade Apprentice (55th Batch) posts, the applications were available for ITIs and Non-ITIs. Meeting all criteria, interested contestants could fill the form before the deadline. Now, they all seek their OFB ITI/ Non-ITI Result or its expected releasing date. Since the Exam is over on 26th March, the board has started checking the ability of the applied and appeared candidates via their presentation in the test. The OFB is a renowned board for its brilliant services in India. It has been delivering top class services and recruiting eligible and talented candidates in its departments as per the requirements. It, in the forthcoming times, will be sharing the information about Merit List and Cut Off Marks with us. As far as the OFB Trade Apprentice 55th Batch Result 2017 is taken into account, it will be released on the basis of overall performance in written exam, interview and a factory-wise merit list will be prepared for all appeared contestants. The exam happened at different exam centres as per the OFB’s decision. Several states have participated in this recruitment and the total 6948 posts are categorised in different factories (names are given below). The overall vacancies have been allocated in different states and OFB’s factories. Due to a large number of posts, the board is taking time for analysing the questions that you had attempted in the exam. The name of some states that are participating in this recruitment are Chandigarh, Madhya Pradesh (MP), Maharashtra, Orissa, Tamil Nadu, Telangana, Uttar Pradesh (UP), Uttarakhand (UK), and West Bengal (WB). If the tie is still there even after going through the above-mentioned criteria, the candidates are to be selected based on alphabetical order of their names. At first, you are required to log on to one of the above-stated websites, such as ofb.gov.in or ofbindia.gov.in or i-register.org. There, you will need to look up the section of “Results” and click on the 55th batch TA (Trade Apprentice) link. Then, you will be meant to enter some required details. Entering the same, submit the same. So is how you can straightforwardly grab your OFB Trade Apprentice Result 2017 by entering some required/ essential details. If you have any concern on Result, Merit List, Cut Off, submit it via the comments. Sir,when would be ofb apprentice 55th batch merit publish?